​Watford manager Javi Gracia praised his side's performance after narrowly overcoming Everton at Vicarage Road on Saturday. Amid a game of few chance, Andre Gray's solitary ​goal was enough to see off the Toffees, in what was only the Hornets' second win in eight Premier League games as they climbed four points above their opponents. "I'm very happy today, after a very demanding game, to achieve three points. I'm very happy for all the players and the supporters. "We knew it would be very equal with some chances for both teams. We had one clear chance for Etienne Capoue early on which we didn't take, and after then it was very equal. At half-time we decided to change the shape and try to go more direct with the second balls and I think it was better for the team." Much of the pre-match talk focused on Marco Silva's return to his former employees, where Gracia took over as boss in January 2018. In his first full season as ​​Watford manager, the Spaniard has guided his team comfortably into mid table, with their latest win propelling the Hornets to eighth, having finished 14th last term. Celebrations at the full time whistle even led to a section of home supporters chanting Gracia's name at the expense of their former manager, which left the 48-year-old somewhat surprised. 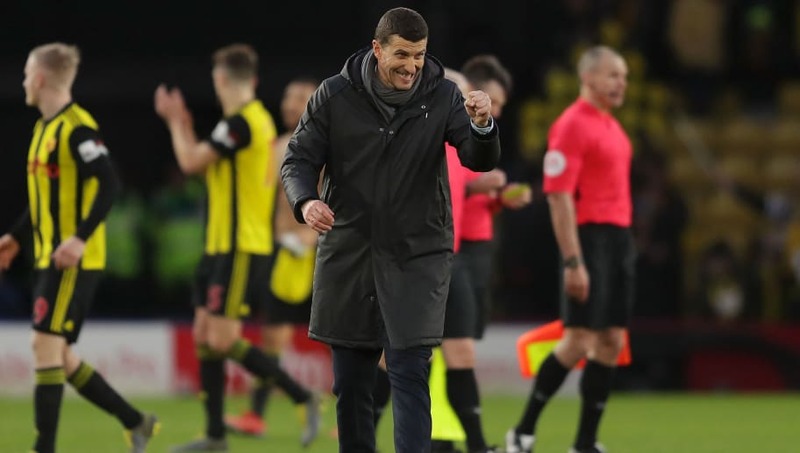 'Javi Gracia he’s better than you' which was directed at Marco Silva, ex-Watford boss. He left in acrimonious circumstances after Everton allegedly illegally approached him while under contract. Watford's results took a downturn soon after to the point he was sacked. ​He added: "That is not usual. I am very grateful, but for me the most important thing is to see that people around me are happy. "I am really happy to get the three points, and after seeing our supporters enjoy the game, it is something that is amazing for us."